Home Education Skegness during their beach clean-up. Members of a home education group is Skegness collected seven bags of rubbish from the resort’s shoreline as part of a practical lesson in looking after the planet. 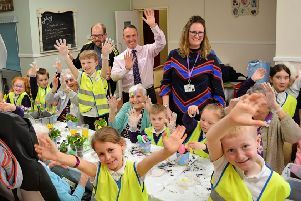 Home Education Skegness held the ‘green’ session on Skegness beach for its youngsters recently with a view to teaching them about the importance of protecting the natural world. It saw the children, who were aged from two to 16, pick up litter and anything else that could harm animals – with a wide range of items being collected on the day. “We had everything from glass, plastic bottles, plastic orange netting to bottle caps, screws and socks!” said Dee Middlebrook, from the group. * To get in touch with the group, find them on Facebook by searching for Home Education Skegness.